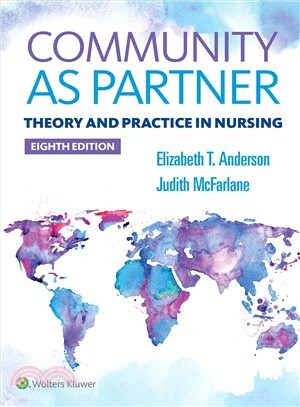 Community As Partner: Theory and Practice in Nursing, 8th Edition offers a foundational overview of the concepts of epidemiology, environment, culture, ethics, empowerment, health policy, informatics, bioterrorism, and emerging infectious diseases as they relate to community health. Authors and theorists Dr. Anderson and Dr. McFarlane of the Community As Partner Model arm students with the “how to” knowledge they need to apply the nursing process to an entire community, and take readers through the entire nursing process with a real-life community as an example! Anderson offers a handbook with practical skills that ACHNE has outlined as essential for generalist nurses, including how to do a community assessment, how to analyze data, how to form a community nursing diagnosis, as well as how to plan, implement, and evaluate a community health program. Community As Partner analyzes the relationship between globalization and health, and inspires students to contribute to the reduction of global health challenges and promoting health for all, including marginalized populations and health promotion in school communities, rural communities, and faith communities. In this edition, instructors will receive PowerPoints enhanced with lecture notes and iclicker questions. These PowerPoints will be developed to serve a dual purpose. You can choose to share the decks with your students to use as self-paced Study Notes and knowledge check multiple choice questions. Our NCLEX style test bank has been revised and enhanced with more questions at the application level and higher.